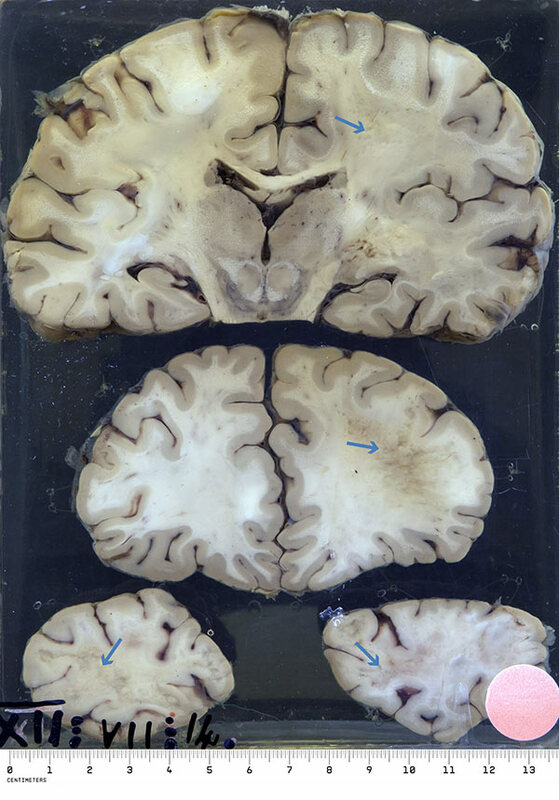 JC virus, a polyomavirus, is the cause of progressive multifocal leukoencephalopathy (PML), a neurological disease now largely associated with HIV infection. PML can also occur in patients with other causes of significant, chronic immunosuppression. Clinical data: The subject was diagnosed with Hodgkin's disease and did well with cytotoxics and radiotherapy for 5 years, when his vision became blurred. Two weeks later he developed a right hemianopia and shortly after that he was blind. Over the next month he became confused and disorientated for time and space. He was soon comatose and died six weeks after the onset of deteriorating vision. Macroscopically: The specimen is three coronal sections through the cerebral hemispheres from above downwards: temporo-parietal, frontal and occipital regions. The white matter of the entire right side is soft and flaky and in the occipital regions both sides are affected →. The softening extends up to the cortex with a sharp line of demarcation. 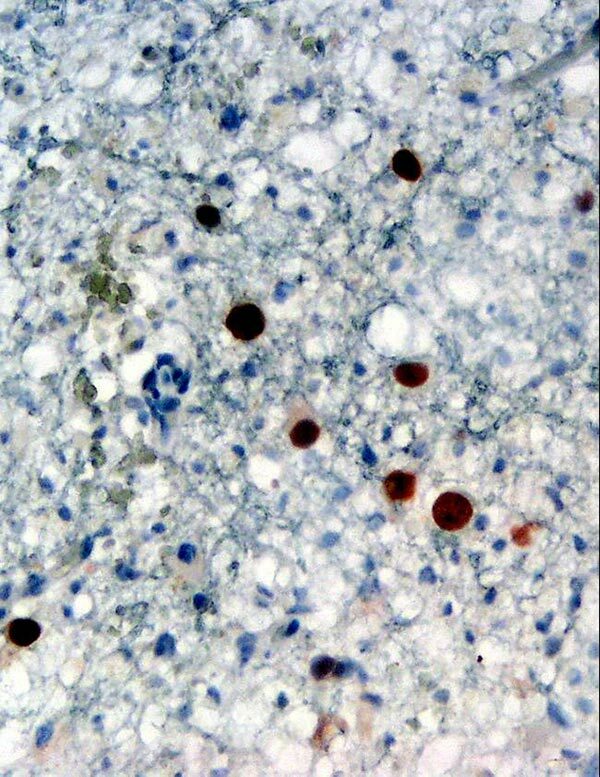 Immunohistochemical detection of JC virus protein (stained brown) in oligodendrocytes in a brain biopsy specimen from a patient with PML. Microscopically: Microscopy showed that the soft flaky areas represent severe demyelination. The axon fibres were intact. Many of the astrocytes were bizarre and multinucleated. Irregular and large intranuclear viral inclusion bodies were present in the astrocytes and glial cells. Comment: The pathogenesis of PML is explained by the fact that JC virus infects and destroys the oligodendrocytes which form the myelin sheaths that surround the nerves in the CNS. This leads to patchy areas of demyelination and loss of function in the affected areas of the brain.